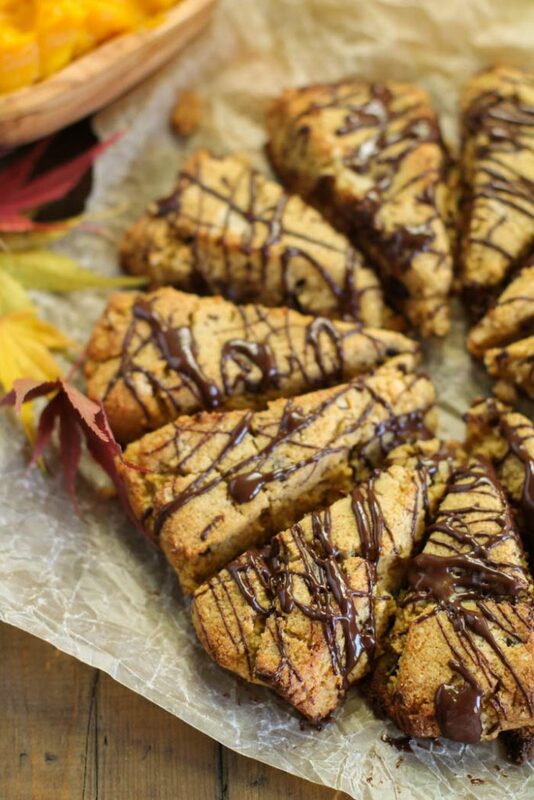 These paleo pumpkin scones are loaded with good for you ingredients and nutrient dense! With collagen as a star ingredient, you can be sure these scrumptious gems have some protein to get you thru your morning! We have been making these scones for time now! I am super confident you will love this recipe!! 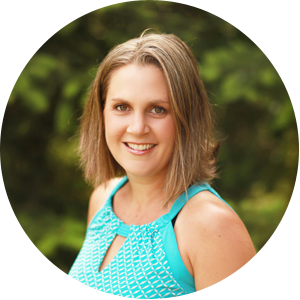 I have added collagen and acacia fiber to up the nutritional bang, just like I did in my keto protein bars! They are healthful additions to any baked goods, and do not alter the flavor at all! The additional fiber and protein will help keep your family satiated! I’ve been adding it my bulletproof pumpkin lattes too, SO good! My hair and nails are thriving too thanks to this addition! These paleo pumpkin scones are super easy to throw together in a food processor and have ready for a nourishing start to a school day, or an after school snack. And if you’re anything like me…having stuff ready to go on busy work and school mornings is a LIFESAVER!! Of course, they may not last thru two whole meals…but double batches are always an option!! 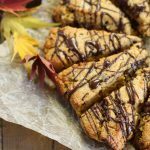 With a tender crumb and hint of pumpkin spice, you will love these healthy scones, and your family will too! Chopped fresh cranberries with orange zest, or dried cranberries too! Any other ideas? I am an orange and cranberry kind of girl..but kids won’t have it. Stinkers. Mom’s needs and preferences always go lat when it comes to baked goods in this house…otherwise I’ll have a whole batch to eat by myself..no bueno!! 1/4 cup acacia fiber optional, adds good fiber! Preheat oven to 400 degrees, and prepare your cookie sheet with a baking mat or parchment. In the bowl of a food processor, place all the dry ingredients, and pulse until the mixture still has some small chunks of fat visible. Alternately, you may cut the fat in using a pastry cutter. Remove the lid and add the wet ingredients in, pulsing just enough to combine. Dough should come together easily when pressed with your hands, if not, add a tablespoon or two of any milk or yogurt until it does. Gather the dough into a ball, handling as little as possible (so as not to warm the fat too much). Pat it into a 10" circle (about) on the prepared cookie sheet. Use a sharp knife to cut the circle into 10 -12 pieces. Using a spatula, gently lift each triangle up and back, giving the scones a bit of space to expand. Bake for 18-20 minutes until just golden and set. Let cool about 5 minutes to firm up, enjoy!! If you like the chocolate drizzle, simple melt your favorite chocolate and drizzle over the tops! I used my favorite lower carb stevia sweetened chocolate this time: Lily's. I eat pumpkin year round and these look like a fantastic breakfast idea, so glad I found it! My oldest just asked for scones for his birthday breakfast this weekend. I am so glad I found your paleo version and love that they contain collagen!!! Yum! I’ve been looking for a good gf scone recipe. This looks just like what I was searching for! Plus I’m a pumpkin-all-year girl;). Mmm. These look so good! Especially the chocolate 🙂 Thanks for sharing. 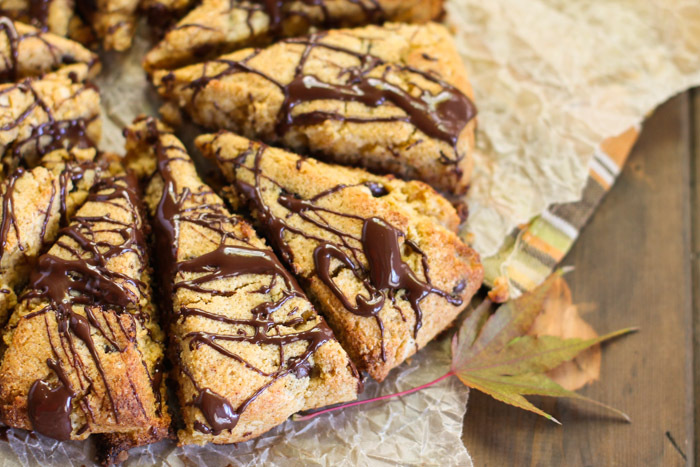 A cup of hot coffee will go so well with these lovely scones! Just delicious! These look so perfect, I love scones on the weekend! That chocolate drizzle on top does it for me! Pumpkin + chocolate is seriously the BEST! Love that these are made with cassava and collagen! Great recipe! I like the combo of pumpkin and chocolate. Yum! Yum! This looks so delicious. I’ve been meaning to try baking with collagen for so long now. Love seeing it in this recipe. YUM! I love the flavor combo and those scones look so delicious! Yes to the pumpkin spice in these.. Can almost taste them! Love how easy this recipe comes together.. and your pics too! Love the look of these and yay for no refined sugar! I love adding pumpkin in baking in any way, shape or form, have pinned to try later! These look sooooo good, Tessa! 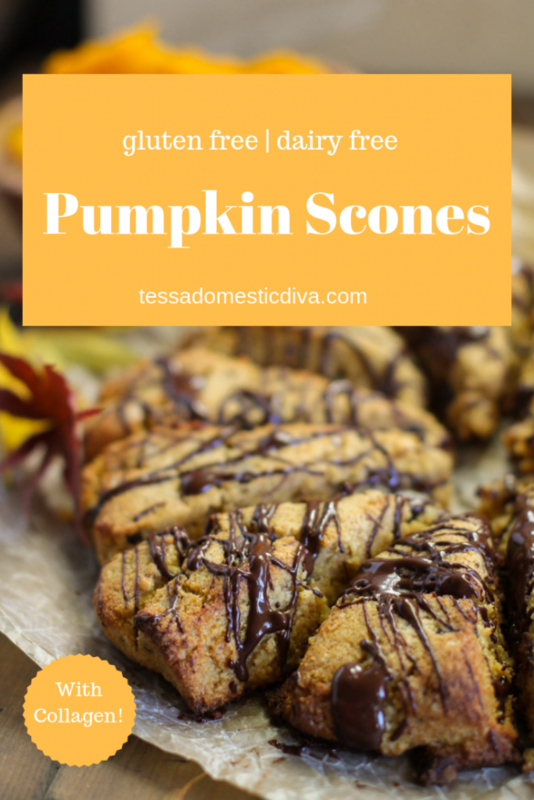 I’ve never tried a pumpkin scone before and I’m going to remedy that! That chocolate drizzle too is such a nice touch!! Such amazing flavors, and the texture of these scones looks spot on! Yum! Oh my goodness. That drizzle! These look so good it almost hurts. That drizzle on top is making me drool- so perfect! These would make a for a fantastic snack or brunch dunked in some black coffee! Yum!! Drooling over this scone and that chocolate drizzle! I’ve never made scones but I think I need to. This looks amazing!